An appeal (p.a. 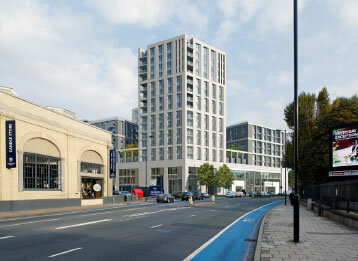 2014/7103) has been lodged at the beginning of July by the developers against Wandsworth Planning Application Committee’s decision to refuse their plan to redevelop 98 York Road with a podium and buildings up to 17 storeys. While the appellant are asking for an inquiry, the procedure will be determined by the Planning Inspectorate in accordance with Section 319A of the Town and Country Planning Act 1990. Overall the main difference is a small decrease of residential units (from 192 to now 173) and increase of cycle space (from 184 to now 200). We fail to understand the need for such a screening opinion while a very similar plan was refused by the Council and while the developers are already appealing on the rejection. It seems that the main reason why the Conservative members approved one scheme and rejected the other is that developers of 98 York Road were not cynical ingenious enough to offer the relocation of an asset similar to the Royal Academy of Dance (of course some would say also that as it was presented before the May general election, Tory councillors did not want to alienate the voters…), which would have been the key element, in their views, to ignore all breach of policy, objections of neighbourhood and harm to the amenities. Demolition of existing buildings. Erect mixed-use development up to 17 storeys (3 storey podium with 14, 10, 6 and 5 storey buildings above) to provide car showroom and workshop on GF, FF and 2F and 173 residential units above (inc. affordable housing). This is a rehash of the scheme turned down by the Committee against the officers’ recommendation.